Well our days have been busy so far turning Scout into our new home. 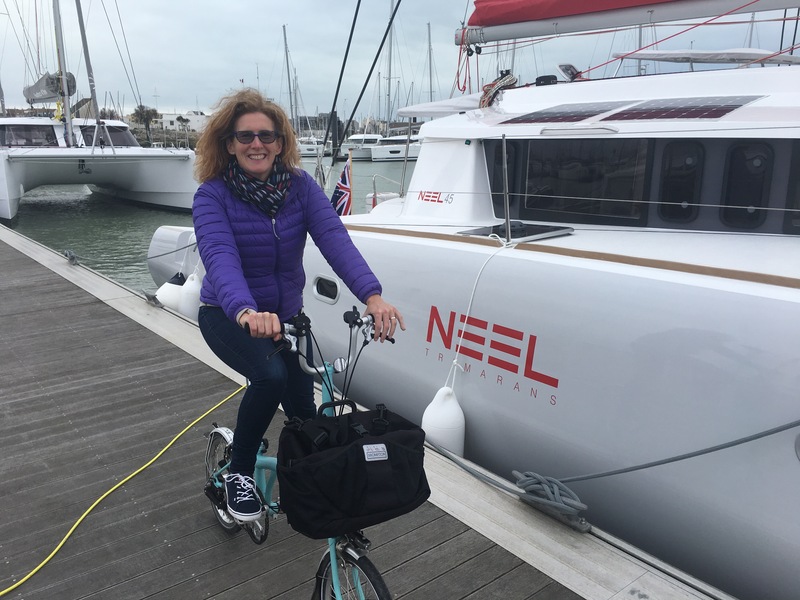 We had become familiar with La Rochelle in our last two previous visits, so with relative ease and a hire car we have been zipping around stocking our boat. We are amazed at how much storage there is on the trimaran and I have been managing to fill it up-a lot. Mike down in the centre hull in the engine room.Photo looking aft with still the same amount of space looking forward. Lots of space to work on the engine and I am eyeing off the available room. With the weather a little bit on the wet side, we decided to dedicate the last 2 days stocking the boat and we have had a lot of fun. It never seemed to end and we have had to go back to the same stores a few times now. We are now parked at the marina and are getting used to be being the packhorses in transporting things from the car down to quay. The most difficult being the life raft. Mike ended having to winch it up high to drop it into its bracket. Sorry I missed that photo opportunity! With a boat that sleeps 6, there are also lots of big and bulky things to bring aboard- pillows, doonas, etc but I think we now have it all sorted. Still to lug down to the boat will be the tender( dinghy) and its motor next week. On the sailing side- we have been out for a short sail with Timothé Bruneel and Mike enjoyed learning some more about handling Scout and in particular how the bow thruster works. It certainly makes docking such a wide boat easier. We are on a side dock at the moment. The real challenge will be practising into a pen. This is all to come. Now we are fairly well stocked the focus from here on will be on the sailing. Mike is currently sitting outside mastering and programming the navionics and over the next few days we will do some more sailing- practising manoeuvres. e.g. man overboard drills etc. Our friends Sylvie and Joël from Champagne will be joining us tomorrow for a few days. We are going to crack a bottle of champagne and have a French naming dedication and make an offer to the gods of the sea. According to legend, each and every vessel is recorded by name in the Ledger of the Deep and is known personally to Poseidon, or Neptune, the god of the sea. We have to make sure we get this correct to ensure good luck and fair weather to Scout. At the end of the week, our second eldest who lives in Vancouver is joining us for a month. Ideally to help us out as additional crew for when we eventually head off over the Bay of Biscay, which will be a 2 to 3 day passage, but also as a wonderful opportunity to spend some time with him. When we set off to Spain, we are not quite sure. A lot depends on the weather, how much handling experience we can get in, Mikes competence and confidence and whether we deem it necessary to have some additional lessons. We are not in any rush and for all our family members reading this, we will not be doing anything premature. So please stay in touch. I am fairly active on Facebook, with more up to date information and I have just amped up our Instagram page where we’ll have more photos of Scout and our travels. When the inside is all settled I will also do a video of the interior to post. PS… while I mention that Mike is doing all the learning, I am certainly going to be following Mike and improving my competence once he is in a better position to pass on to me the skills I need. After all I am not just here for the cruise! On another note, La Rochelle experiences huge tidal differences. Unlike anything I have seen in Australia. This huge marina is set on floating dock and here is the difference between high and low tide. Categories: cruising, sailing | Tags: cruising australians, La Rochelle, neel 45, neel trimarans, sailing | Permalink. It has been a whirlwind of changes and developments over the last year and a half, but I can confidently say that it is all coming together, perhaps even better than we may have planned it. Eighteen months ago, the prospect of what we had to do seemed daunting to me and our two year time frame seemed endless but, on the contrary the time has gone by so fast and everything seems to have naturally fallen into place. One of the biggest decisions we had to make was what we were to do with our business and our farm and our home on the Gold Coast. Something had to go to make our purchase of Scout attainable. Lengthy discussions and analysis ensued and we made the initial decision that we had to sell our farm and wind up the business, leaving us with our home on the Gold Coast. We had a coffee farm in the beautiful hinterland area of Byron Bay and a business, roasting and selling the coffee to customers online and in markets.A successful boutique business with lots of loyal customers. Not such an easy decision. Mike had poured so much of his life into being a coffee farmer and we passionately loved the property but we soon came to the realisation that to make our next dreams come to life, it would have to be sold. If it didn’t sell, then it was going to be back to the drawing board for plan B. After what felt like a long time, the farm sold successfully in May this year and over the last 6 months we have wound up our coffee company. While the decision to sell was a difficult one, when the sale went through it was with a feeling of relief and excitement that we could now focus on Scout and our journey to move aboard. Our Children- now all adults. When we started making our plans, we knew we couldn’t possibly have left any earlier than planned as we still had our youngest at school and our older children were still finding their feet and starting to make their way in life. So the plan was to begin our adventure after the youngest had been out of school for a year and was in a settled position. It has turned out to be perfect timing. Of our 6 children, the three eldest have settled into very happy job paths and careers that have taken them interstate or overseas. No 4 is about to graduate from uni next month and move into the work force. No 5 is cruising along with part time uni but happy to move in with friends and away from the apron strings and the youngest, well he is loving his studies at uni which involves attending college in the country and has to spend his semesters living there. The Dog- the hardest of all to accommodate into our plans. Our dog Gemma is a farm dog. She is a Maremma and if you know this breed you would be familiar with how difficult it would be for them to live in a small property. That just about ruled out everyone we know who could possibly look after her for us while we are away. So rather than rent out our house for a year, we have found some friends, a retired couple who are going to house sit and look after her for our first six months aboard. With the logistics solved it was now time to get on with the preparation of Scout and ourselves as sailors. We both knew that we had to supplement our basic sailing abilities and skills with some additional training to at least give us some confidence in sailing offshore and handling a larger boat. Mike has attended two live aboard off shore courses, both with Sunshine Sailing at Marooychdore on the Sunshine Coast. He attained his Day Skipper qualification with the RYA and gained experience with both passage planning and hands on practise. I completed my competent crew qualification with the RYA at Pacific Sailing School at Rushcutters Bay in Sydney. I thoroughly enjoyed it. Our course was conducted by Lisa Blair who at the time of writing this blog is about to set off to become the first woman to circumnavigate the Antarctic solo, non-stop and unassisted. Good luck Lisa. I will be following. It was a terrific 5 days and the information and experience I attained was extremely valuable. And what better place to do my training than in beautiful Sydney Harbour and Pittwater, near where I had grown up. The New Year arrived and I also decided to add to my goals and conquer French this year. I sat down with some books, tapes, videos and subscribed to a social media language learning site called Italki. My goal was to be at least conversational by the end of the year. We have, of course a french boat and what better way to get to know her and her builders and environment than to learn the local language. I am pleased to say that my French has greatly improved and while I am by no means fluent, I am conversational ( just) but my comprehension, listening and reading has met my target for the year and I have one more month to go to still improve. I also have dabbled in some Spanish and Italian – enough to get by. That sums up briefly the very hectic changes in our life over the last 18months. We have also spent a lot of this time reading blogs…. thank you zerotocruising for being our initial motivators, Miss Catana ( fellow Australians) – watching hours of Youtubes….La Vagabonde, Catamaran Impi, Trio Travels, which have not only been entertaining but a source of great sailing cruising information. Also a special mention to the series Distant Shores, whose sailing adventure TV series was invaluable and highly enjoyable. On top of that, countless hours researching all the conflicting information on everything from what anchor to buy to what bedsheets are best in the tropics. I don’t think we have turned on the television for 18 months. We have been constantly glued to the internet. I am hoping our blog posts will be more frequent now as we approach our departure date. 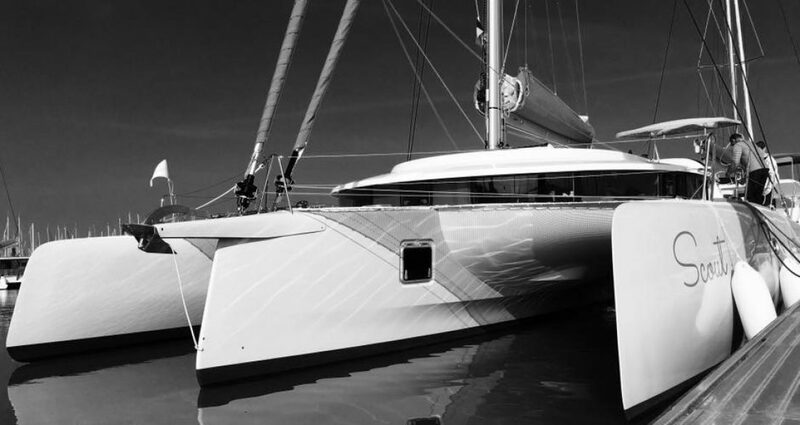 We recently returned from a visit to Scout, who has been built and is waiting for us in La Rochelle. I will write a post about that visit shortly but for more up to date posts on what is happening please have look at our Facebook page – Scout Around The World– and our very new youtube channel where I have posted my first attempt at making a movie showing our first meeting with Scout a week ago. Categories: cruising, sailing | Tags: cruising, cruising australians, neel 45, neel trimarans, sailing, trimaran, yacht | Permalink.